this is a456: "Ideological Mildew"
An ideological illness is like mildew and requires preventative measures. Like mildew, it is due to septic germs and various parasitic agents. So the treatment of men with appropriate solutions is indispensable ... Air-dropped leaflets are telling our peasants of a new kind of ideological mildew beginning to ravage our land ... we must preserve the healthy elements of our society and heal those that are ill ... we must fight all diseases of both the vine as well as of Society. The significance of this statement lies not so much in its obvious metaphor, but in its reference to mass communication as a way to fight societal ills and other threats to the establishment. Aircraft spread propaganda leaflets in the same way as herbicides or defoliants. Communication, as a mean of societal control, must therefore have a hygienic function. The images of Hèbrard and Andersen's proposal, however, show a heavy Beaux-Arts inclination. This is most evident in plan, where the giant center axis dominate. The center of the City is much more biaxial. An elevation of the project's dominating central feature—the Tower of Progress—also shows some Beaux-Arts flourishes. To call the building monumental is to give it short shrift: it was an overscaled, polystyled collection of triumphal arches, columns, pilasters, and apertures culminating in a lantern that is part-Bramantian Tempietto and part-Christmas ornament (and perhaps even an anticipation of Socialist Realism). 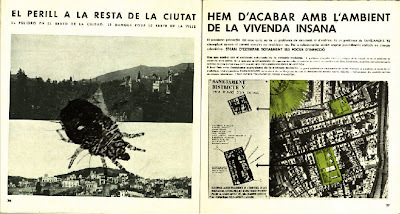 The importance of these last two phases is shown in a series of montages entitled “El Perill a la Resta de la Ciutat” (“The Danger in the Rest of the City”) and “Hem D’Acabar Amb L’Ambient de la Vivienda Insana” (“The Asphyxiating Environment of Unhealthy Living Must Finish”). The first montage features photographs of old parts of Barcelona. Superimposed on top of these images is a blown-up picture of a louse. The second montage shows an aerial photograph of Barcelona’s Fifth District. Two of the district’s unhealthiest areas are shown as being cut out, replaced by vivid, green spaces. The text reads, “The primary problem of the city’s ancient core is neither a problem of circulation nor of aesthetics. It is a problem of SANITATION. Neither the widening of streets nor the narrowing of sidewalks will resolve anything. In order to solve this problem, it is necessary to use the radical procedures of urban surgery: THE SITES OF INFECTION MUST BE REMOVED.”8 These clear images suggest a political connotation as well—the infection is political as well, for we are to understand the louse as an emblem for dangerous Nationalist elements infiltrating Spanish society. In the above examples, science—whether in the guise of social ideals or as a basis for rational planning—becomes a message with which to communicate ideas about sanitation and hygiene. Whereas Hèbrard's and Andersen's World City of Communications emphasizes "clean" communications, issue 25 of A.C. demonstrates how media can be used to emphasize the correlation between ideological and physical health. And as the opening example from Z suggests, the city, whether idealized or dramatized via media channels, became the terrain for such protracted discussions. This all resonates, quite uneasily of course, with Jean Baudrillard's characterization of media as "the unclean promiscuity of everything which touches, invests and penetrates without resistance, with no halo of private protection, not even his own body, to protect him any more. "9 Or, put another way, more signal, less noise. 1 Jean Paul Alaux. American Institute of Architects Journal 2 (March 1914):159. 2 Paul Rabinow, French Modern: Norms and Forms of the Social Environment (Cambridge: MIT Press, 1989), p. 249. For more information on this project, see Ernest M. Hèbrard and Hendrik Christian Andersen, Creation of a World Center for Communication (Paris, 1913); Guiliano Gresleri and Dario Matteloni, La Citta' Mondiale: Andersen, Hèbrard, Otlet, Le Corbusier (Venice, 1982), 12-45. 3 Rabinow, French Modern, p. 248. 4 Hèbrard and Andersen, quoted in Ibid. 5 “Influencia de l’ambient sobre l’individu … urgent transformació dels barris insans.” A.C. Documentos de Actividad Contemporánea 25 (June 1937), n.p. in Jordana Mendelson, ed., Magazines and War 1936-1939: Spanish Civil War Print Culture. 6 “El urbanismo debe ser tratado, de aquí en adelante, en formal racional, como una ciencia.” A.C. Documentos de Actividad Contemporánea 25 (June 1937), 3 in AC/G.A.T.E.P.A.C. 1931-1937 (Barcelona: Ediciones Gustavo Gili, 1975), 3. 8 “El problema primordial del casc antic no és un problema de circulació ni d’estètica. Es un problema de SANEJAMENT. Ni eixamplant carrers ni corrent voravies no resoldríem res. Per a solucionar – ho caldrà emprar procediments radicals de cirurgia urbanística: S’HAN D’EXTIRPAR TOTALMENT ELS FOCUS D’INFECCIÓ” Ibid., p. 27. 9 Jean Baudrillard, "The Ecstasy of Communication" in Hal Foster, ed. The Anti-Aesthetic: Essays on Postmodern Culture (New York: New Press, 1999 ), p.132. good read. around 1946 in bogota, the proa journal would publish similar articles, claiming urban planning would eradicate poverty, crime and health problems. the common link here is sert, although he left barcelona around 1936-7 and was not involved with proa [who saw him as foreign competition for a task to be done by colombian architects]. Originally conceived as a place to post thoughts about architecture, this site now contains a variety of design-based ideas that cut across various disciplines (for more fun, you can go to my other site or you can say "hello") .